I have created a new part of this website devoted solely to my songs. Link to it right here! Sunburst Carousel for saxophone quartet is now published and distributed by Murphy Music Press. The score can now be purchased directly from the Murphy Music Press website. I’m looking forward to some new projects for the coming months that include new works for pianist Mabel Kwan, percussionist Andy Bliss, the Astralis Duo (soprano and piano), as well as a new duo for bass clarinetist Christa Van Alstine and percussionist Michael McCurdy and a new work for flute and percussion for the Iktus Duo! Monochrome Variations for cello and electronics has just been chosen to be included in Society of Composers, Inc.’s upcoming edition of thier ongoing publication Journal of Scores. This summer, I have had the pleasure of working with Richard Schwartz, both as composer and performer, on a new recording project that is being set for release later this year on the Centaur Label. The project is a collection of chamber works for alto saxophone along with piano and computer generated sound in various combinations by composers Kari Besharse (my lovely wife! ), Stephen Suber, Ray Pizzi, and myself. Recording engineer Bill Kelley and I are currently working on editing the recordings. It has been an incredible experience; I’ve been learning a great deal about the recording process along the way.I think that one will find this album to be a very refreshing mix of works by composers of diverse voice and direction, and I very much look forward to the release! 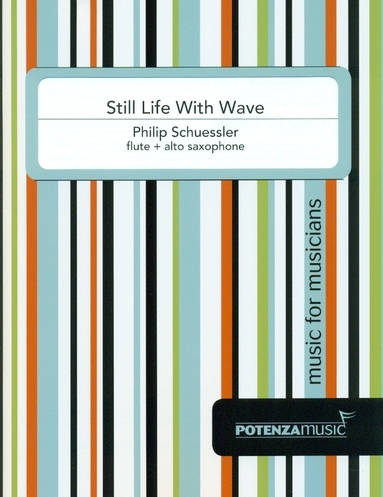 In other news, I’m pleased to announce that the score for my work Still Life With Wave for flute and alto saxophone has been published by Potenza Music. Potenza has shown great support for my music, and I am grateful for their publishing of it. The work was written for the Duo Fujin 2012 Weekend Composition Competition, and it continues my fascination with tightly-wound rhythmic structures that interlock and collapse in various ways. Speaking of music publishing, I have co-started, along with my wife, composer Kari Besharse, a publishing company of our own called Pendula Music. Pendula is dedicated to the distribution of our works to a wider audience of performers and contemporary music enthusiasts. The company is just getting off the ground, but we will have a website up soon through which scores will be made available for purchase and perusal. Also in the works is a nonprofit presenting organization of contemporary music concerts! More on this soon! Finally, I am putting the finishing touches on a new work for bass clarinet duo entitled Colonel Ketchum’s Celluloid Delirium Spiral. Remind me to tell you about the title some day! On August 23rd, I had the pleasure of once again performing the work Embers for alto saxophone and piano by my talented wife Kari Besharse along with saxophonist Richard Schwartz at the Tuscaloosa New Music Collective. The concert was a great success and featured a diverse set of new works by some very talented composers. In October, cellist Craig Hultgren will be premiering a new work for cello with computer at Southeastern Louisiana University. The work will be funded in part by a Composer Assistance Program grant that I received from New Music USA. In November, violinist Jubal Fulks will be touring the southeast with a program featuring my new work Binding Song for violin and horn. Jubal will be making a stop at Southeastern Louisiana University for a concert that will also include, among other pieces, Ligeti’s highly acclaimed Horn Trio. This summer has been productive for me. I will be entering the fall with four completed works, one of which (Still Life With Wave) is a winner of Duo Fujin’s Weekend Composition Competition. New pieces are in the works! I have been asked to compose a new work for cello and live electronics for cellist Craig Hultgren in anticipation of his guest visit Southeastern Louisiana University in the fall. I have also been asked to write a duo for violin and horn for violinist Jubal Fulks, and I will be writing a trumpet quartet next year’s National Trumpet Competition. On Wednesday, November 2nd, the Southeastern Louisiana University Concert Choir, conducted by Dr. Alissa Rowe, will perform my work Ghost for SSAATTBB chorus at the First United Methodist Church in Hammond, LA. In past news, last March brought about the premiere of my new work Interruptions III for alto saxophone and tape. The work was written for and premiered by Richard Schwartz at the North American Saxophone Alliance Region 6 Conference at the University of North Florida in Jacksonville, FL on March 19th. The same conference saw the premiere of Embers, a work for alto saxophone and piano written by my wife Kari Besharse. The piece was premiered by Richard Schwartz (alto saxophone) and myself (piano) on March 19th.